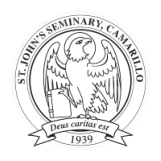 Seminarians, faculty, or staff members are free to invite personal visitors to the seminary. Sunday is the regular day for inviting visitors. At any other time permission is to be obtained in advance from the Director of Students. Visitors may be invited to attend Mass, enjoy the campus and tour the seminary in the company of the host seminarian, faculty or staff member. Individual visitors may be invited to meals if the visitors are few in number and arrangements are made to notify the kitchen in advance through the refectorian. Those visiting the seminary, other than priests and seminarians, are not to use the swimming pool or the swimming pool areas. Visitors, except priests and seminarians, should not be introduced into the students’ living quarters. This rule applies to visiting days as well as at other times, with the following exceptions: immediate family members accompanied by the seminarian may be allowed in dormitory rooms on certain days indicated by the Director of Students. Respect for the privacy of other seminarians and their living quarters calls for observance of these norms by all. Guest rooms are available for visiting priests, religious, seminarians, and prospective seminary candidates. A student guest master is assigned each semester to prepare rooms in the dormitory buildings for male visitors. Rooms for visiting women and married couples, and for priests wishing to stay on the faculty corridor (St. Vincent’s Hall), may be requested through the Director of Students. Permission is to be sought well in advance from the Director of Students before inviting any visitor to stay overnight, including members of the clergy. No one under the age of 18 is permitted to be an overnight guest. Visitors not guests on “official seminary business” are asked to make a donation to cover the cost of their stay: Breakfast, Lunch and Dinner at $5.00 each. The seminary welcomes groups to visit the campus under the following conditions: Guests are to be the personal visitors of seminarians, faculty or staff members or the official guests of the administration. Groups not directly associated with students, faculty, staff or administration are not invited to visit the campus. The administration may invite group visitors for purposes of public relations or vocation awareness; such decisions are made directly by the Rector. Special circumstances relate to the Episcopal Office of the Santa Barbara Region, as governed by agreement with the Archdiocese; such decisions are made directly by the Rector or the Business and Facilities Administrator of the Seminary. Seminarians, faculty or staff members may request group visitors if (a) it is a group with which they are directly involved, for example, through field education, internship, or their own parishes; (b) they will be with the group at all times; (c) the group is not larger than twenty persons; and (d) the group is not invited to meals although the members of the group may bring their own meal and use available facilities. The visit of groups meeting these requirements is to be approved in advance through use of the Group Visitors Request Form available from the receptionist in the main office, and submitted to the Director of Students and the Business and Facilities Administrator for approval.